This training not only explores what makes teams effective but how to develop skills as facilitators and knowledgeable group members in informal and formal settings of all group sizes. 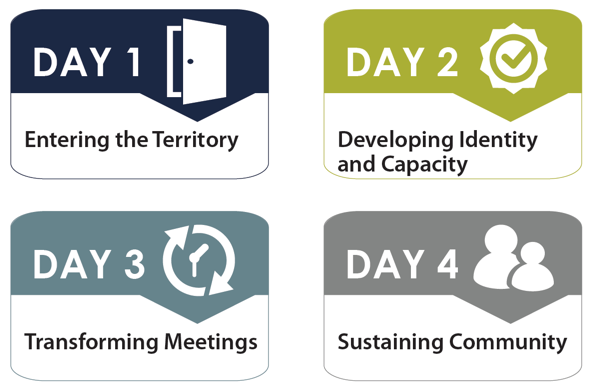 Participants will move beyond the idea of professional learning communities into the actual implementation, describing specific ways to weave the collaborative fabric of faculty, develop group member skills, and acquire the principles and understandings to engage a continuous cycle of a team and individual improvement. Adaptive Schools is the “how” of professional learning communities: how to behave in groups, how to lead them, and how to facilitate them for improved leading, teaching and learning. "Students learn more when adults learn more. If adults aren’t learning to grow their practice and refining their craft, students won’t. We need to be the learner we want our students to be. Learning to be adaptive through this series helped us realize that change is merely the space between where we are and where we aspire to be. Shifting from meetings to collaborative learning opportunities has built a learning-focused culture and allowed me to be a learning leader."